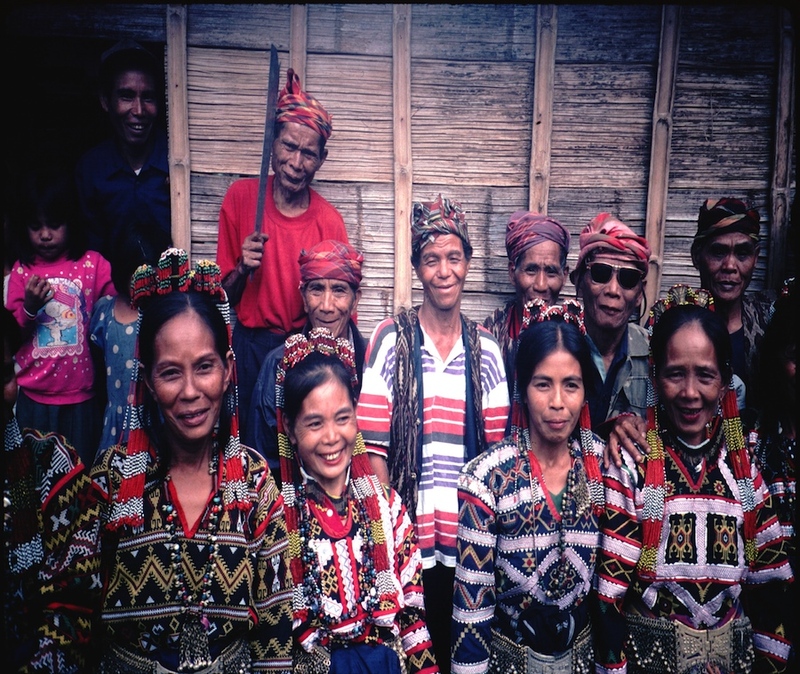 We are very grateful to the T'boli tribe members, particularly members of the Helobung T'boli cultural troupe for taking time to share very precious aspects of their lives, through documentation, personal interviews and performances, as Gumbay Sulan did. 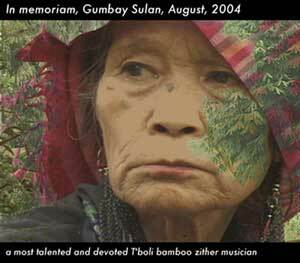 We are sorry to hear about Gumbay Sulan's passing, a very talented T'boli bamboo zither player who died after the production of "Preserving Culture". Click on her photo (right) to access a few images of Gumbay that we have added in recognition of her passing. We also regret the passing of Jesse Ankoy, or known as Mafil, a T'Boli lute player who died on Oct. 25, 2014. He plays in the third clip, below, at 7:15 in the clip and obviously had a lot of talent as a musician and was a kindred soul. . The producers would also like to thank Philippine Airlines for co-sponsoring our production by providing complimentary airline tickets, and The Punta Isla Lake Resort for providing accommodation for our video crew. We also would like to thank the South Carolina Arts Commission, for awarding "Preserving Culture" with an individual artist grant for post-production work. The South Carolina Arts Commission receives support from US's the National Endowment for the Arts. Lastly, a thank you to Laura Simms for allowing us to reprint her beautiful strory, 'T'Boli Dreaming - Keeping the Channels of Culture Open', (below in full) about visiting the T'boli tribe. Here is Lonely Planet's listing for the T'boli Schools of Indigenous Knowledge and Traditions. 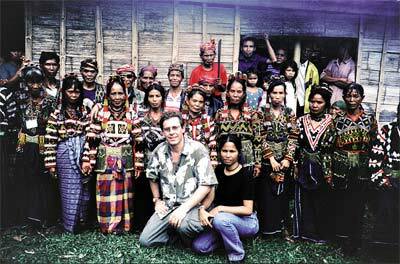 Alan Geoghegan videotaped for 2 magical weeks in Lake Sebu, Mindanao in the Southern Philippines with the T'boli tribe. In 2014, "K’na The Dreamweaver" was the first Philippine feature film set entirely around ancestral Lake Sebu and filmed in the t'boli language: an Interview with Director Ida del Mundo. I am happy to announce to say my video Preserving Culture The T'boli of Mindanao, Philippines part 1 is the most viewed video on t'boli or t'boli culture on You Tube, with over 16 thousand plays. A Native American storyteller in the Yukon suggested to an Icelandic novelist traveling to New York that she get in touch with me. We agreed to meet at a Greek diner on Broadway. Both writers and travelers interested in a similar process of creativity, we quickly became friends. I offered her my home while I traveled to the Philippines so she could finish her novel. In exchange, she read my coffee grinds, something my own Rumanian mother had done for me while I was growing up in Brooklyn. Seated at my kitchen table, she upturned the drying coffee cup and asked me, "Is there something uncomfortable about this trip?" "Yes," I answered surprised. 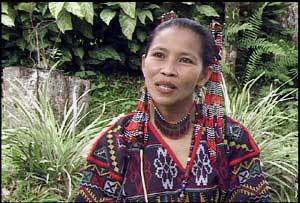 "I feel frightened of the week I am to spend with T'boli people in the south island of Mindanao. I know nothing about them." "You will feel fear," she said, "but you will discover a treasure." I arrived in Manila during monsoon season in early August. Manila is in Luzon, the northernmost island of the more than 7,000 islands awkwardly formed into a country by the Colonial Spanish over 300 years ago. Destroyed during World War II, it suffers the horrors of a modern day city too quickly created in a third world culture. There are no reminders of ancient history, and few traces of its colonial grace remain. What natural beauty it has to offer is hidden by pollution and overshadowed by dense poverty and overpopulation . I was traveling to T'boli as part of a month-long storytelling tour to gather stories. 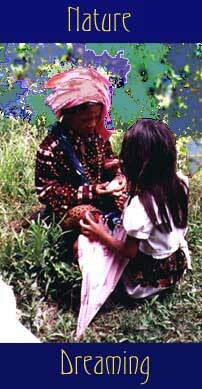 At that time my only encounter with T'boli tribes had been the few paragraphs in The Philippine Handbook: "An estimated 200,000 T'Boli inhabit the Tiruray Highlands, a 2,000 square-km area within a triangle bounded by Surallah, Kiamba and Polomok..."
In Manila I found that any time I mentioned my upcoming visit to T'Boli I was greeted with tremendous interest, curiosity and even awe. I was shown brass bells, beaded necklaces, photographs of elaborately costumed women and treasured Tinalak wall hangings, the sacred ceremonial cloth of the T'Boli Still, I felt a growing sense of unease. Why was I going to T'Boli? Was I to add to the increased exploitation by mining, forestry and tourism? Worse, I knew nothing of their traditions or taboos. My coffee reading was of no consolation, although I often reflected on it. I have learned from my own travels and experiences that an outer journey is an inner journey. The most unexpected occurrences are usually the most significant, and the actual map is a secret map whose contours depend on my own receptivity to what unfolds moment to moment. I considered my journey to T'Boli a quest, a pilgrimage to a way of life rapidly vanishing from our planet. In Manila, I said to myself, "It is best to surrender to the fact that I know nothing and remain alert." In fairy tales, esoteric and symbolic stories, it is the fool who becomes the hero or heroine. Sent out into the world, she does not know in which direction to travel. So she shoots an arrow, throws a stone, or a feather. Where it lands is the direction in which she journeys. I spent one week in Manila, hosted by the kindness and hospitality of the most lovely people in the world, surrounded by the shock of unending, miserable poverty and an unbreathable atmosphere. I looked forward to my trip south. "Welcome. The necklace is T'boli". The first evening in Davao, protected by an armed guard (wealthy families are often kidnapped by remnants of Marcos' rebel army), I was taken to dinner in the best Filipino restaurant. The other guests were: a real estate mogul and executives from an auto company and an oil concern; men intent on bringing the Philippines "into the 21st century." The conversation revolved mainly around a golf tournament. The next day our odd traveling crew began the journey to T'boli: a translator from the tourist office, the driver of the air-conditioned white van, a T'Boli man returning to Lake Sebu after a market visit to sell Tinalak in Davao, and me. "It is best to travel on Saturday," I was told. "You will be less conspicuous." Davao is advertised as the largest city in the world, spreading out for miles and miles. With the added obstruction of traffic, stray chickens and dogs, the trip was long. The urban landscape is a strange mix of palm trees, rickshaws, bustling markets, flamboyant flowers and diesel buses packed with people. World War II jeeps painted in wild colors and splattered with Christian prayers mingled with vans carrying sad-faced pigs to slaughter. Suddenly, the city gave way to grassy hills, rice paddies and people riding on water buffaloes. The sunlight erased the memory of urban sprawl and we all began to cheer up, until the smell of burning garbage hit our nostrils and a dark cloud of ash marked the road ahead. We rode through a modern nightmare of garbage dumps adorned with ash-dyed bamboo houses and dust-covered children and cows. As my eyes adjusted,I was amazed at the ingenuity of these houses made of trash. The translator from the tourist office explained that these people make their living from sorting out the debris. I felt in awe of their resourcefulness. Finally, we left the outskirts of the last large city behind, polluted and jumbled with every conceivable mode of transportation; sports cars, diesel busses, trucks, bicycle-drawn rickshaws, men on horseback and farmers on carabao. We rode in silence for hours over dirt roads deeply rutted from the rains. When we came closer to South Cotabato the rains began. We stopped for lunch at an outdoor restaurant on Lake Sebu where the T'boli live, and sat under a thatched roof at the water's edge. The T'boli catch fish in a banca, a carved out tree trunk, cook them on an open fire and serve it on a thick leaf. Skinny dogs lay under our table, where I proceeded to throw fragments of fish and bread. 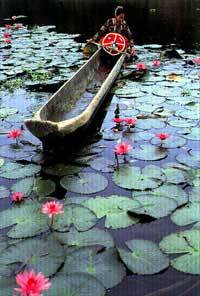 (left) A T'Boli woman paddles her Owong through the water lilies on beautiful Lake Sebu. This postcard was photographed and donated by Vilhar & Anderson for the benefit of the Helobung Troupe Cooperative at Lake Sebu, a project to preserve local culture and arts, as coordinated by Maria Todi Wanan. 600 looked out at the lake. Small hill-locked islands with bamboo houses dotted the water. Mountains in the distance. Smells of rain and forest. An old woman at the back of a banca fished silently. Teenage boys paddling a flat boat took fish from her in a basket and brought them to the fire. Behind her were the patterned nets of new fisheries, a plan engineered by a European to increase the catch of fish on the lake. The birth of an industry. The sight of the nets sent chills down my spine. The driver had told me how quickly the ecological balance on the lake is shifting due to fisheries, mining and forestry. (L-R, above) Gumbay Sulan, Zither expert, Oyog "Maria" Todi-Arrozi, Alan Geoghegan, Ursula Aznar & Cecille Sanchez take a coffee break during the video shoot. Humbled, I went to the T'Boli market. Crowded. Walking, shopping clusters of people conversing. The foreignness and inaccessibility of the T'Boli seems startling. They stare at me momentarily, but have no interest in my presence. Only the salespeople seem to take notice of me. 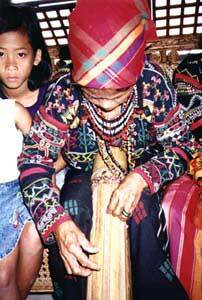 The T'Boli women in full traditional costume are stunning: small and Malaysian-looking in many-colored sarongs and delicately embroidered blouses, women and girls adorned with foot-long earrings, layers of necklaces, hats as large as umbrellas, stacks of anklets and bracelets: red, blue, black, white, green, turquoise. I have no reference point for these faces born out of a 25,000-year-old history of trading between Indonesia, these islands, China, Africa, Polynesia and Arabia. The words of a Maori chant come to mind: The power and the prestige, the garments of your ancestors. There was a stirring of interest in me over the next two days, as it became known that I was a storyteller. I had attended a T'Boli wedding. I was seen walking around, taking a trip in a boat on the lake. People offered to tell me stories, and a dance concert was arranged in the lower room of the T'Boli guide's bamboo house. Women performed in full costume one at a time (including a beautiful swallow dance, as graceful as the most elegant Javanese court dance), accompanying themselves with makeshift drums and gongs made from parts of trees, rubber shoes and kitchen pots. In the background, a row of old men watched a television show featuring the new Spanish Miss America dancing flamenco-style. But where were the stories? At last I was granted an interview with a princess who was a weaver. My translator was Peter Corado, a T'Boli lawyer. I hoped to find a story about the origin of weaving. 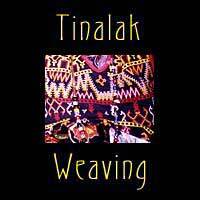 I know many myths from Africa and Polynesia about weaving and the origin of language, and the traditional Tinalak fabric of the T'Boli was fascinating to me. A stalk of notched bamboo served as a ladder to the house of Princess Diwa Tel, alias Ye Wala. I took off my thongs and climbed up behind Peter. The floor was made of thin strips of bamboo, and through the spaces I saw the earth below. Unable to conceive of walking on what looked like paper, I froze. Peter pulled me in. I felt as though I were standing on a thread of a hammock. 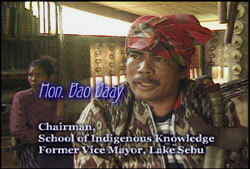 Former Lake Sebu Mayor Bao Baay, bringing culture to new generations through native education and a T'boli museum. The old woman was seated by an opening in the wall which served as a window. She said, "I am sick and cannot speak for a long time." I inquired quickly about the story of the first weaving. 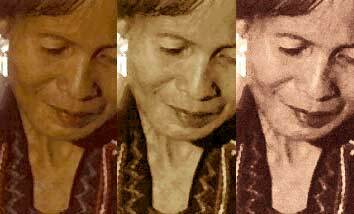 In the center of the room, I saw her loom, a half-woven Tinalak growing from its base. In baskets next to the loom were balls of tie-dyed fibers made of banana hemp. She explained in detail how the Tinalak is made & ; the plants chosen, bark stripped, boiled and prepared, dyed, blessed and so on. She then told how each single pattern is dreamed by the weaver. "Each design is new. No other person has made this exact design. They come in dreams in three ways: from the ancestors, from one's mother, and from one's own dream. The channel of the dream must be open." In order to be woven, each new pattern must be dreamed anew. "I never watch television or listen to the radio," she said. "There is an evil spirit in the television." The channel would be disturbed, clogged. Then the dreaming would not happen. 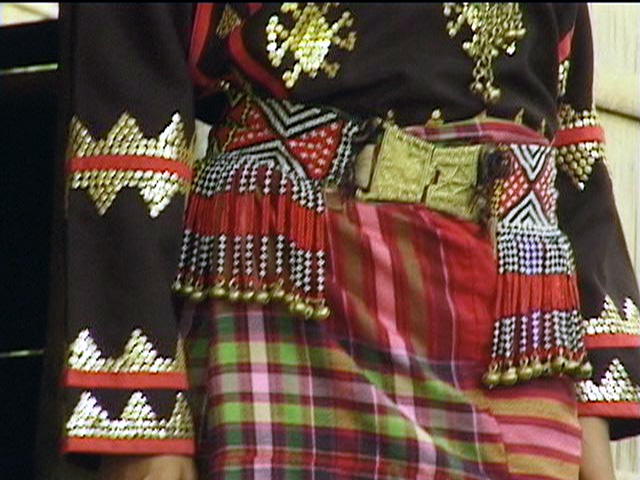 The blouses that the T'Boli women wear are famous for their intricacy and uniqueness. They are red and black and white, the colors of the alchemy of the soul in fairy tales. "Some blouses take one month to finish. The ones embroidered with small seashells can take one or two years to complete." "The world is changing all around you. It is inevitable. Someone will come and convince the T'Boli to have their patterns manufactured to make money. What must remain for the people to still be T'Boli?" 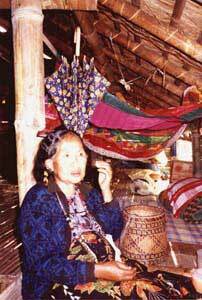 She answered in the pleasing rhythmic pattern of T'Boli language. Her words were couched in the incessant hum and trill of birds and crickets from the rain forest that surrounded the house. As she spoke, I became aware of a new sound, the overwhelming metallic drone of a motorcycle which was being repaired down the road. I leaned forward to hear her words and Peter's translation. 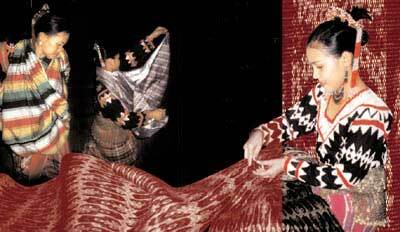 "Women must continue to weave, to make jewelry, baskets,to sing and tell stories," she stated. Her daughter brought out her tribal clothing: necklaces, bracelets, earrings, the 13-pound brass belt adorned with T'Boli bells and carved metal, an embroidered shirt, eight thick brass anklets and six wrist bracelets, the beaded wooden hairpiece and a pair of earrings which extended from the earlobe and wrapped around the neck like a collar. He put them on with the daughter's help. Transforming herself into a veritable temple, she became a visible map of her ancestors, her culture, and nature. She smiled proudly. Then she lifted her skirt and showed her tattooed calves, which would make her recognizable at death to the ancestors in the other world. Again, the words of a Maori chant returned to me: The womb of the earth is your pillow. "And what if these things are washed away by flood, or earthquake, or are mass manufactured for sale without dreaming?" I asked. "It may happen. What must be left for T'Boli to exist?" Now she grew quiet. She nodded. Peter, a man educated in the West, listened intently. I looked out at the forest and the houses. A horse, fleeing, suddenly dashed from behind another bamboo house. Three men chased it. The carabao tied by its nose to a log looked unconcerned. The trees moved. I felt the bamboo floor sway in a sensuous response to the wind. When she began her answer, she spoke confidently, looking into my eyes for the first time. I answered her with my own eyes as Peter translated. She said, "Sharing. Hospitality." On cue, the sound of the motorcycle engine stopped. Her daughters served us coffee as she described the necessity of living together, of sharing all one has with others, whether family or strangers. The princess moved uncomfortably. I recalled the warning about her poor health at the outset of our meeting and began to thank her for her time, for her generosity, for her profound teaching. 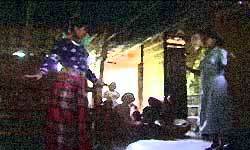 We offered gifts of rice, liquor, beads and money. Her reception of them was simple. She held them, acknowledged them and placed them beside a basket on the floor. As we climbed down the ladder, I saw an exquisite old basket near the loom. She called out to Peter, "It is an old one. Made by a Mandaya woman. I traded for it in the market a long time ago." She looked so fragile, her house so flimsy. Our eyes met again, a simple human connection, not extraordinary or special, and a light went on in my mind. The subtlety and meaning of what she had just said struck me: "Sharing. Hospitality." The drive back from T'Boli to Davao was more harrowing and twice as long. Several hours into the trip the car broke down. While it was being repaired, we waited more than four hours inside an airless fast-food restaurant. When we finally arrived in the city and climbed out of the van, our T'Boli guide opened his tattered suitcase and gave me a gift: a hand-dyed Tinalak with a frog and seed pattern. Nothing that I had to offer to him or to Peter or the princess could be half as valuable, except perhaps my gratitude and respect as I write this. Four days after my visit to the T'Boli, a volcano on one of the lakes that had been quiet for hundreds of years erupted, destroying people, hundreds of houses, T'Boli artifacts and animals. What did I learn from my journey to this remote Filipino village? That the forms of culture & stories, houses, clothing, carvings, weaving, songs, dances, are the visible means of protecting knowledge, without which we would be less than human. They are a visible map to an invisible world within ourselves, a map that leads to no place and every place. Moreover, that if we can remember the ways to sink into reciprocal being, if the channel is left open to dreaming from that country within each one of us, we can dream all that is needed in being again. This is the treasure I brought back with me from T'boli.